This relaxing getaway affords all the luxuries of home away from home. Spacious, comfortable, well maintained. This 3 level corner property boasts of 2200 square feet of living space properly adorned with warm and amiable furnishings. 1.5 miles to both Rehoboth and Dewey beaches. Approximately 2 miles to the nearest shopping outlet. Indulge yourself in this relaxing home - a home with most, if not, all the necessities to make your stay enjoyable. *** NOTE *** This property is very well maintained by the owners. It will be rented out to individuals and groups that will guarantee to keep it in its good condition. Due to safety reasons, we limit occupancy to 6 people only. No pets please. The location is conveniently situated 1.5 miles from either Rehoboth Beach and its boardwalk or the ever active Dewey Beach area (during peak season). This home is 2 miles away from the Tanger Outlets, which prides itself of more than 100 stores, open all year-round for totally tax-free shopping experience. Situated in a quiet, family friendly and very conveniently located neighborhood. Within walking distance to a coffee shop and restaurants. A short drive to downtown Rehoboth. George and Malou were very thorough and detail oriented from the time we booked the rental to the follow up. Always responsive and The house was beautiful, new, updated, and very well kept. We would definintely look into renting this home again!! Owner's reply: We always feel fortunate to be given the opportunity to provide comfort during ones stay. Thank you so much for choosing our property this year. We look forward to having you again in the future. My family and I enjoyed the home very much. Easy access to the beaches and restaurants.The house was clean and very comfortable and felt at home very quickly. Loved the fact that everyone had their own bathroom and the downstairs bedroom was perfect for my 90 year old mother.The owner was very kind and made sure that we were settled in and very willing to accommodate us if needed.The neighborhood was very quiet and quaint. We plan on coming back next year. Owner's reply: Thanks so much for choosing our property this year! We strive to provide as much comfort as possible too our guests. We definitely look forward to having you again in the future. All the comforts of home and more. Close to shops and restaurants yet far enough for those relaxing moments. The hosts were very friendly and always a phone call away if you had any questions or concerns. We met them the first day,They are are a great couple. This place is definitely the place to stay for a relaxing vacation. Owner's reply: Thanks so much for choosing our property this year. We are absolutely thrilled you had a pleasant stay. We look forward to having you again in the future and to providing you the comfort while you stay in our place at Rehoboth Beach. Our family had a wonderful time. Owners are extremely responsive and courteous. The three floors were great in regards to spreading the children out... So close to both dewey beach and rehobeth. We would definitely rent again! This townhome was exactly as advertised and the owner was responsive and great to work with. It was well maintained and very clean and had everything we needed for our vacation. I would definitely stay here again. Owner's reply: Thanks so much for choosing our property this year. We are absolutely delighted with your review and are glad that we could provide comfort in your stay at Rehoboth Beach. We look forward to having you again in the future. Thank you so much! This condo was absolutely the best! i have had much experience renting places for vacation and I must say this one is exceptional. The owner is so attentive and informative about the condo, the town, all the ins and outs, it was a wonderful experience and I highly recommend this place to all. Comfortable, clean, homey, and the every request quickly attended to. Owner's reply: We were definitely elated to have you choose our place this year! We are extremely pleased you had a good stay. Thank you so much! This was our first trip to Rehoboth and we were extremely happy with this rental. The house is beautifully maintained with great accommodations. It is close to everything and the owners are very good at managing the rental process. I would definitely return again! Owner's reply: We were extremely pleased to have you stay at our home this year. We look forward to having you again in the future. Thanks!! This was our first trip to Rehoboth, and the home was great! It was close enough to the beach and all the activities surrounding it! It's in a nice and quiet area! Loved it and had a wonderful time! Owner's reply: Thanks so much for choosing our place this year! Appreciate the feedback and look forward to hearing from you again in the future. The place is absolutely beautiful. All my wife and I can say is "Thank you, George, for a great vacation!!". First: access to the property using the codes provided by George (the owner). This concept is just brilliant! Instead of carrying keys at all times, all we had to do was enter the code of our choice and we had access to the property. No more fear of losing keys...especially while at the beach. Just enter your codes and the door unlocks. 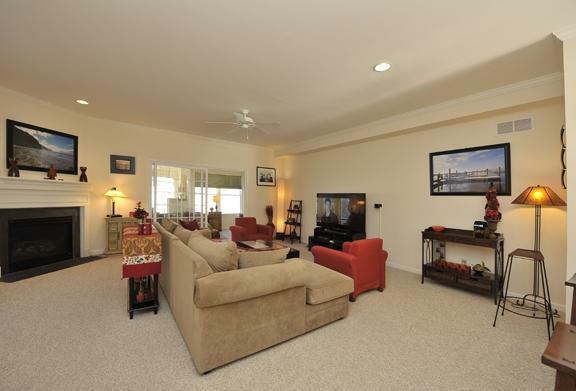 Second: Upon entering the property, you are greeted with a bright, spacious hallway. Immediately, you know the owners really do care about this property. The furnishings in this entry level is just so inviting. The main level is perfect. The 46 inch HD TV, the sound system, the furnishings and decor, the warm lighting. The colors chosen for the furnishings and decor makes the place so comfortable. The kitchen is aptly furnished with eating and cooking utensils. We did not expect what we got - we were like..."WOW". The bedrooms were extremely comfortable. A full bath in each of the bedrooms too!! The grounds is just gorgeous! Lushly appointed with greenery! The townhome is not far from the beach! It is literally less than a 5 minute drive to Rehoboth Beach, Dewey Beach, to the outlet malls, and walking distance to both Big Fish and Arenas restaurants..both good eats and the service is just great! You need to be early though because both get packed with diners. Lastly, the owners....very warm and accomodating individuals. First off, we reserved the place abit late...last week of May. George the owner said not to worry, we'll make it work. I sent the payment but the payment never made it to the owner. Again, he said, don't worry, we'll make it work. I had to resend the payment. George notified me promptly that payment was received and we were all set...this being the Thursday before our stay. To the owners of this property, thanks so much for having us this year! We had a blast!! All I can really say is that it felt like being at home. It was relaxing, and enjoyable from the moment we arrived until we left. Thanks you so much for everything, directions, being readily available for our questions and letting us into your wonderful home. We had a wonderful vacation at Rehoboth Beach during the week of July 11, 2015. George, the owner of the rental property, was absolutely great to work with. He provided great customer service and was extremely accommodating. His townhome that we rented was beautiful. It was very clean and neat and well-maintained. We were close to everything including the beach, restaurants, shopping and all kinds of activities to do. We would highly recommend this townhome to anyone who wanted to rent a fabulous place and have a great time. Thank you George for everything and we will talk to you for future rentals.